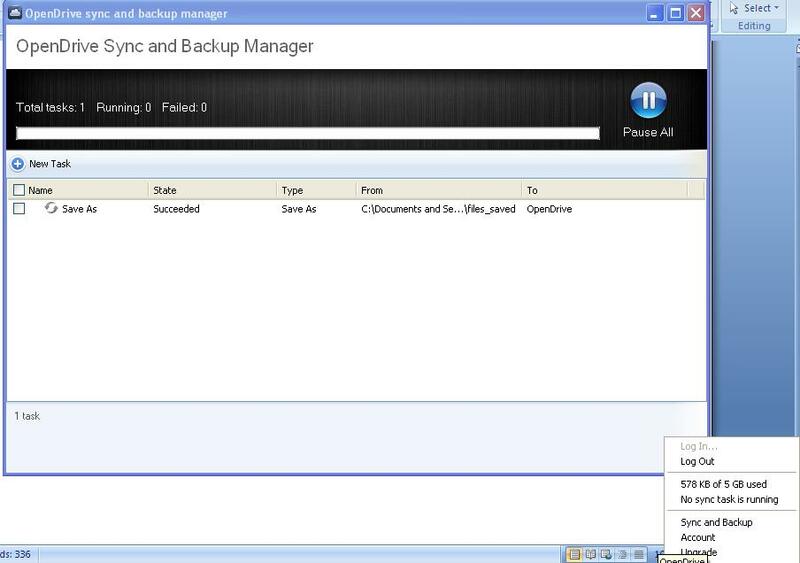 OpenDrive offers great service for a wide variety of backup needs. It covers the gamut of large to small storage needs, business or personal. The company’s stated missions are allow management and sharing of data simply and securely, provide advanced account and easy user management, and provide simple and secure online backup. In recent years, the California-based company has gone to a state of the art N+1 backup system configuration, and it is cross-platform capable supporting Mac, iOS, Windows and Android. OpenDrive is also easy to operate, is available in 13 languages, and currently the program serves over a million customers worldwide. OpenDrive began about five years ago as a solution for individual users, and by keeping data management solutions attractive, simple and secure they acquired a large demand quickly. Their popular demand eventually moved them into the business-accessible sector, and more than a million personal users and 20,000 businesses worldwide currently call OpenDrive home for their precious data. OpenDrive’s quality and class of services is award winning. Among them are TopTenReview’s Silver Award in 2011 and 2012, the Excellence Award in 2011, Brothersoft Editor’s Choice, and Soft82’s prestigious 5 star awards. 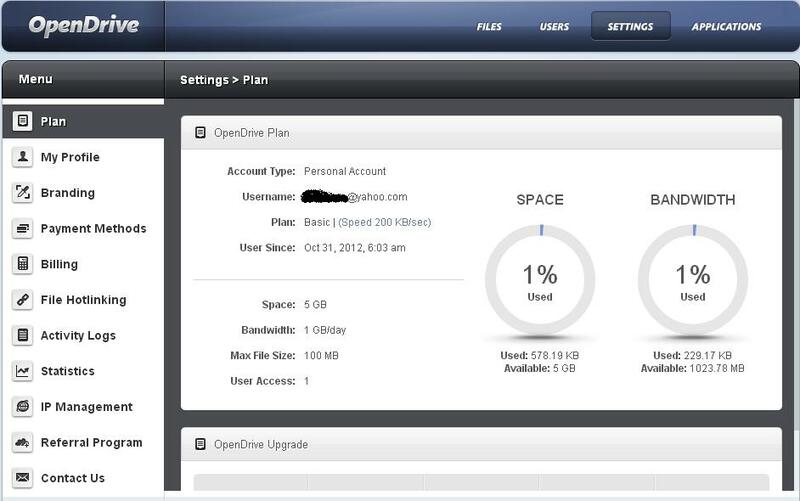 OpenDrive offers multiple standard plans as well as custom ones, and they offer a fine customer support base. State of the art data centers compliant with SAS70 Type-II standards and the latest software security mechanisms exist to keep data locked away safe and sound, and quickly retrievable. OpenDrive has one free option for up to 5 GB, three tiered payment plans, starting at 100 GB, and a custom plan that allows price variation upon a sliding scale. There is a yearly pay option for all pay plans, but no discount exists for choosing this option. 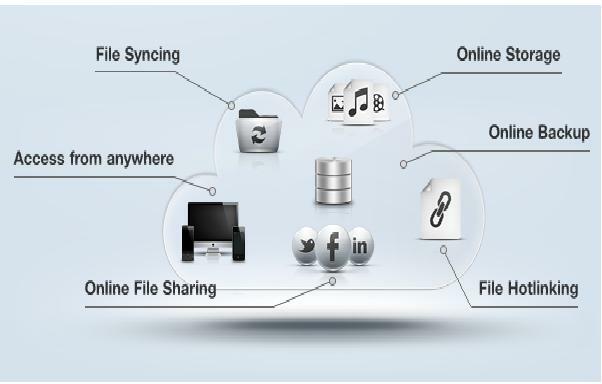 OpenDrive’s objective seems to be in providing a single file source in the cloud with the ability to access said data from multiple devices. This philosophy differs from the school of creating multiple copies across connected devices, or mirroring existing computer files. To achieve this single-point approach, OpenDrive creates a virtual file system either on your computer or mobile device, thus allowing the original to stay put. 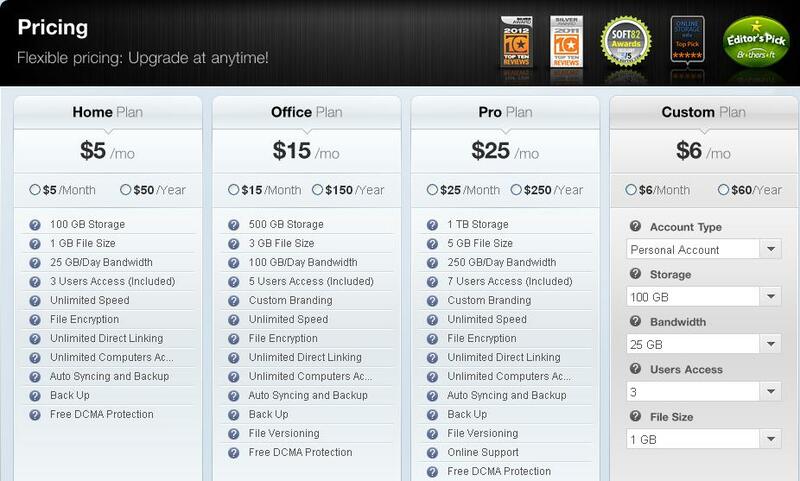 The following picture illustrates OpenDrive’s features and objectives. Here’s an extensive list of features. Onboard access to something like 17 useful programs like MS Excel, Word and PowerPoint regardless if the programs exist on your device. Wonderful support with 24×7 operation accessible by phone, email, TT systems, etc. Security is one of OpenDrive’s main concerns. Thus, their industrial-grade protection is a plus not only to business owners, but the average Joe gets to enjoy some pretty high tech data safety. 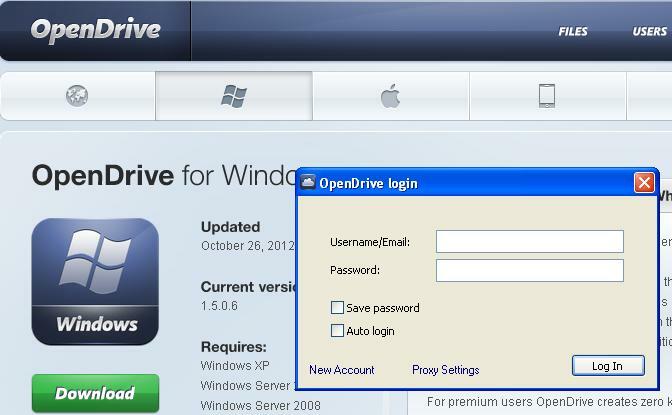 Here are some highlights. .
OpenDrive provides answers to trouble in a number of different ways. First, there is an extensive Knowledge Base search engine available on the Support Center’s main page. If that should fail to resolve an issue, telephone and email support are available through live customer service reps. 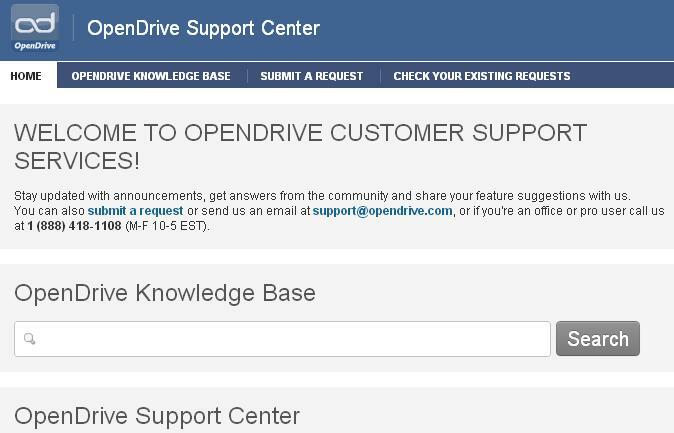 Here are some customer support features offered to OpenDrive clients. Sign up and installation are simple enough. Most anyone with a little computer knowledge should have no problem with OpenDrive’s operation. Here’s a lowdown on how it all works. 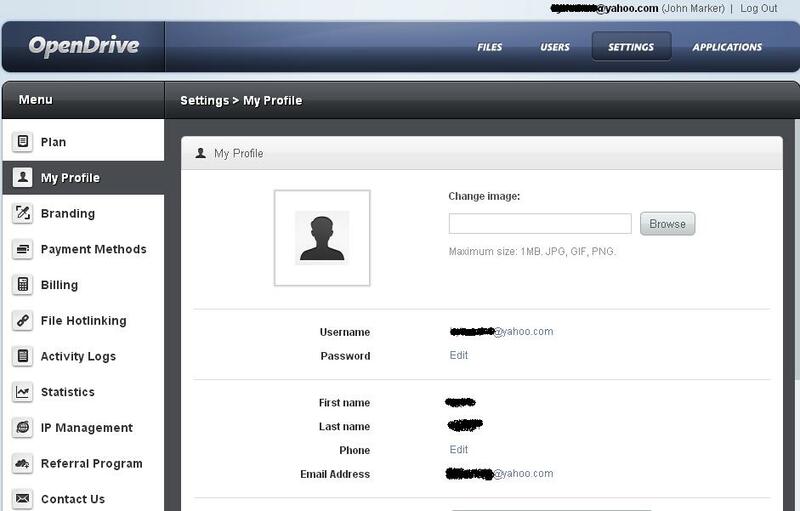 The account Home page is laid out simply, as shown below. 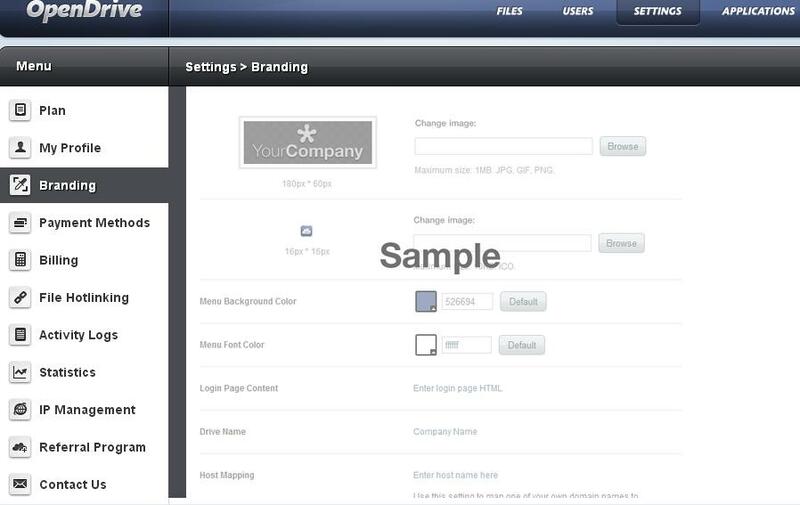 The four main user interfaces from this page at the top are for file management (Files tab), user settings (User tab), sytem settings (Settings tab), and Applications. The page loads the Files tab by default, and directly under that are your file options. You can upload, download, set up a new directory, trash a file, or retrieve something from the web. First, let’s take a look at uploading files from your computer. 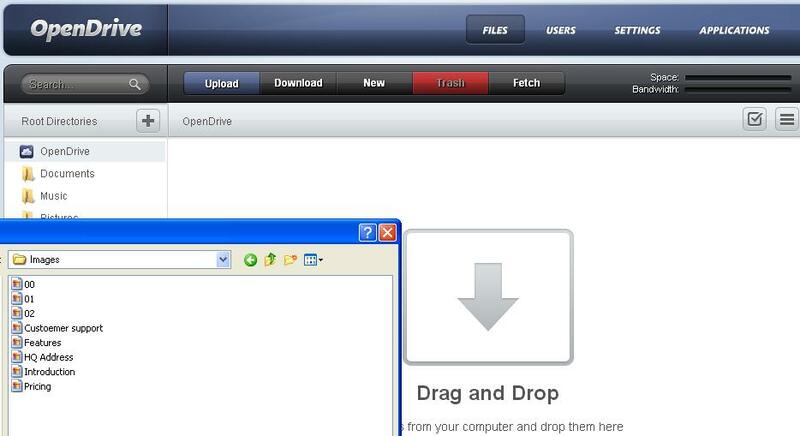 There are two methods: drag and drop files from a source file to the OpenDrive upload field, or highlight the file(s) and click the Upload button. Downloading is as easy it gets. 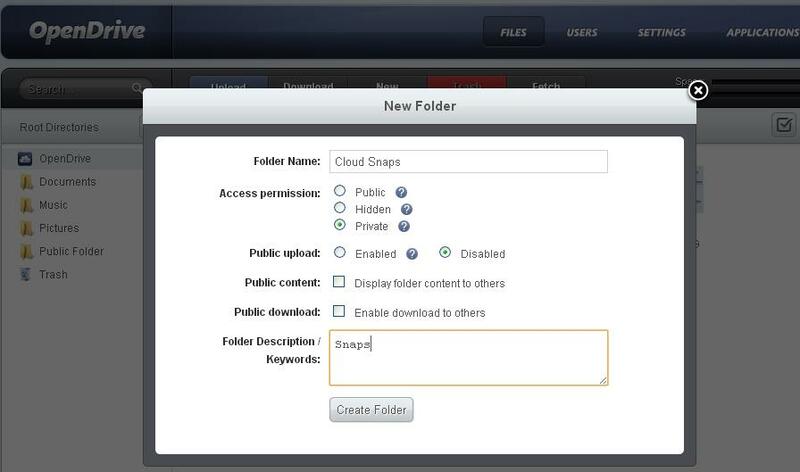 Choose the file from your Root Directory (on the left side of the main interface page) and click the Download button. That’s it. 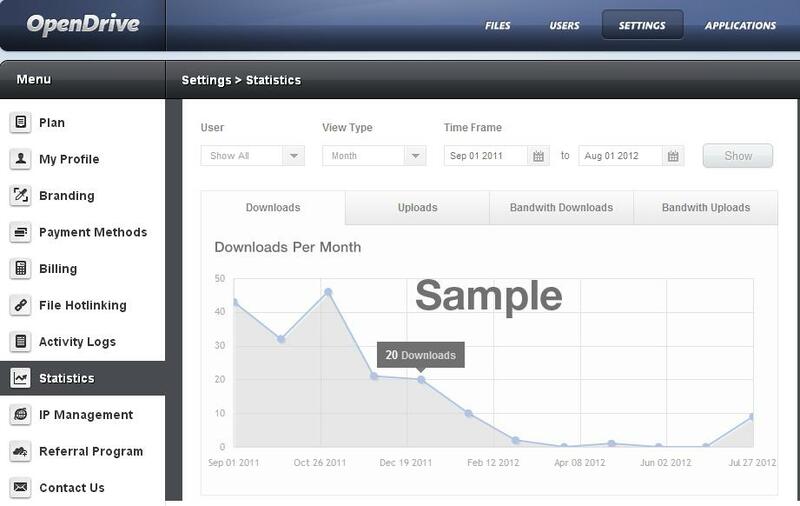 OpenDrive sends downloads in zip form to your computer’s main Download folder. 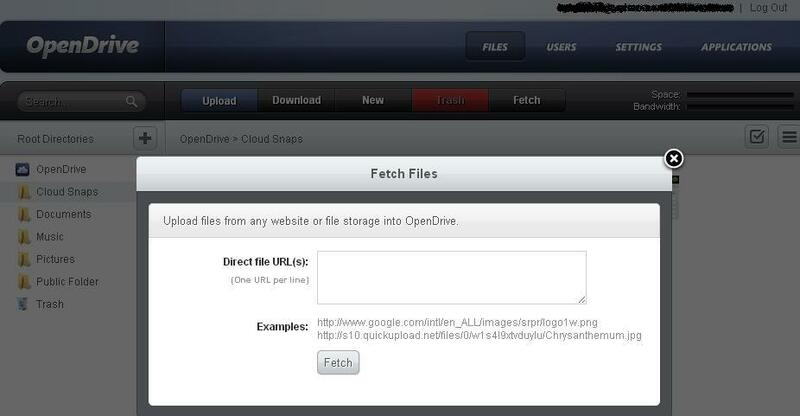 To retrieve online data directly from a website to your OpenDrive backup account, click the Fetch button. 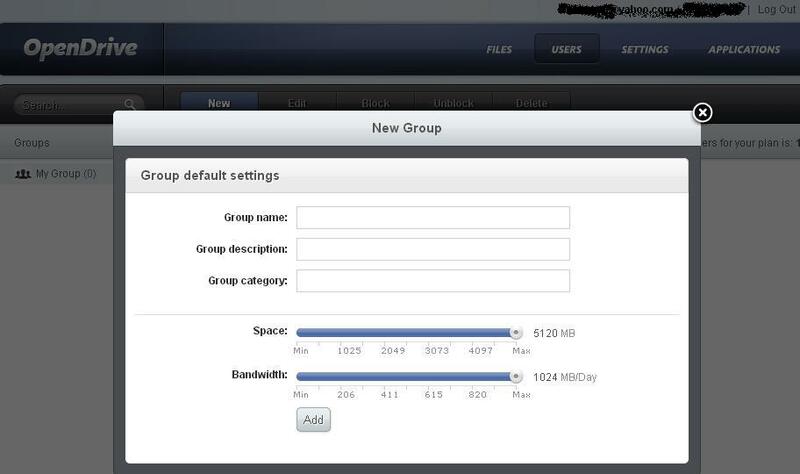 Fill in the name and description of the group, allocate resources, and then click Add. Your new group is added. 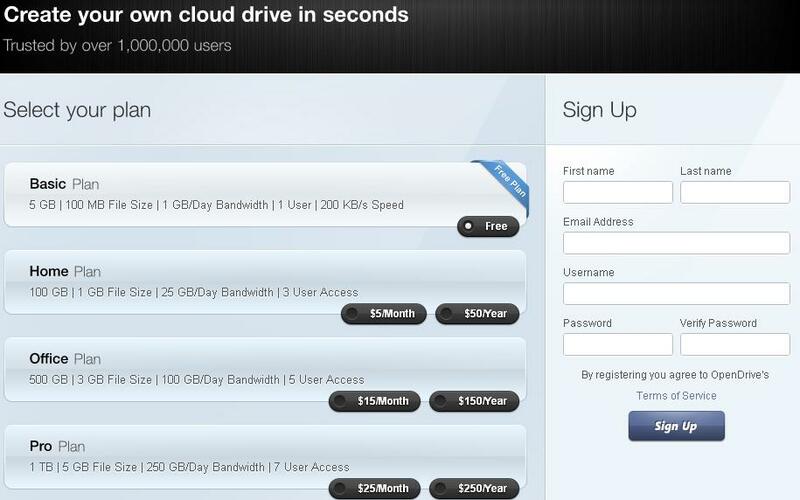 OpenDrive provides a highly customizable user platform for administrators. 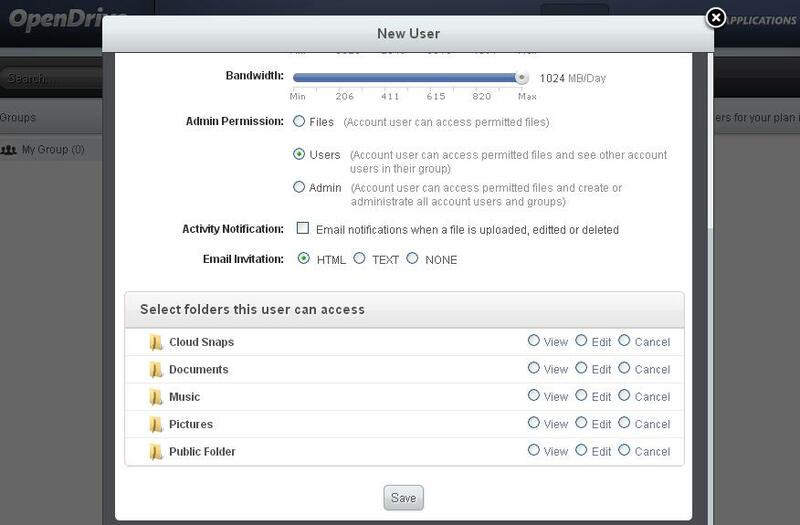 From exact allowable space and bandwidth allowed by a user, to individual file authorization, the interface is helpful to organizations seeking highly specialized access to its users. Payment Methods should be fairly self-explanatory to anyone who’s ever bought or subscribed to anything online. Enter your card number, etc. To use hotlinking, follow the instructions under the File Hotlinking tab. Terms and conditions apply. Follow account activity and overall usage statistics from the Activity Logs and Statistics tabs, respectively. If you are looking for a highly featured and secure online-backup and file-sharing service, OpenDrive should be a perfect match. 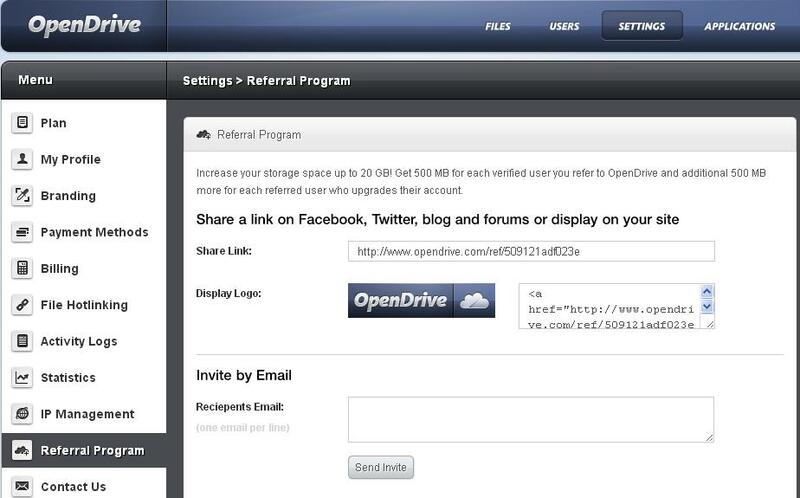 OpenDrive evolved from a company tailored specifically to individuals into an all-encompassing one. Therefore, their interface had also evolved from the basics and therefore is unintimidating to work with. Recent security upgrades to the company also put OpenDrive at the top of reliability. Overall, OpenDrive is a very high-quality data backup and management platform that can be trusted to do what it’s supposed to. 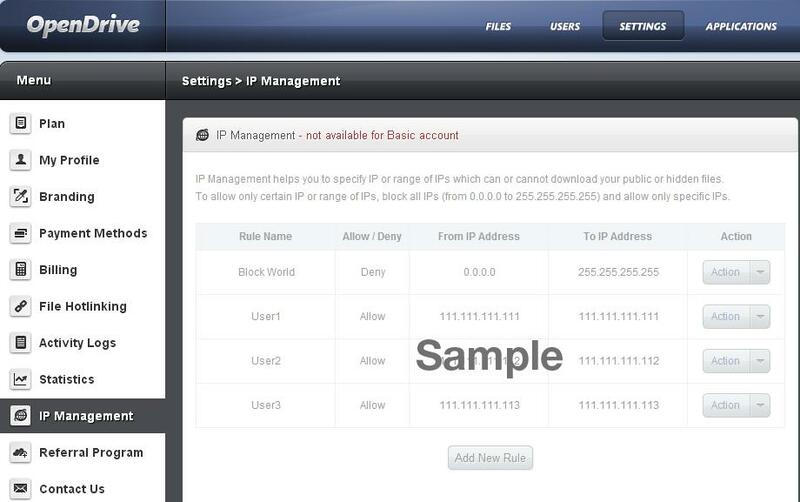 It’s possesses a level of user and security customization that many other providers lack. Highly recommended. They do not have 100% security in their files, if you do not ensure them one by one. Attention! They do not refund the money in the first few days if you are not satisfied. I wasn’t ever able to even configure their terrible software to select a folder to back up. The client froze due to the poor quality of the software. I contacted support who FULLY ADMITTED the software “didn’t work” and they politely asked me to wait for new software. I said I did not want to do that. I also asked for a refund since I had never uploaded one byte of data to the service successfully. They refused. They also refused to cancel my account, rather they quoted the T’s & C’s at me. This company clearly puts profits before customer service. Do not trust your data to them! I now use Crashplan and couldn’t be happier. I don’t use them any more, but when I did they were fantastic, their customer service was really better than anywhere else I tried.